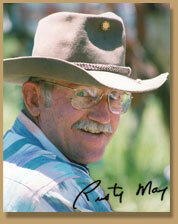 Rusty May has been making saddles and leather accessories for over 40 years. His techniques used for making saddles were learned from many years of working with Master Saddle Makers. His saddles are famous the world over for quality and craftsmanship. Browse our site and get some ideas then let us build the saddle of your dreams. 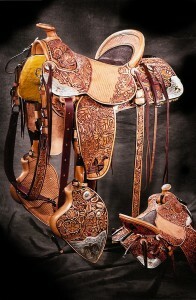 All saddles pictured are custom made and matching accessories can be made for any saddle. We also specialize in horse tack, saddle bags, western chaps, rodeo chaps, holsters, rifle scabbards, horse halters, harness, spurs, and all your saddlery needs for kids to adults. If you are looking for leather gifts, we also do billfolds, belts, handbags, guitar cases, holsters, scabbards, vests and dog collars. Call or E-mail us today for all your saddlery needs for Rusty May’s custom saddles, horse tack, saddle bags, holsters and leather gifts. 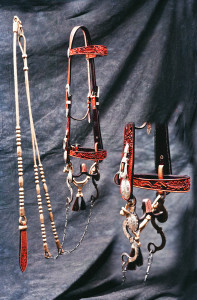 His techniques used for making saddles were learned from many years of working with Master Saddle Makers. His saddles are famous the world over for quality and craftsmanship.